One New Aftermarket Replacement Radiator Core made for. Tractor models: G (SN: 60700 >, w/ Water Pump, Gas), 70 (Gas), 720 (Gas SN 720000>), 730 (Gas SN 720000>). Dim (A) 21.625" Core Height Dim (B) 19.00" Core Width. Our new radiator core is designed and built to precise dimensional specifications to ensure an exact fit. Each core is made of copper fins and a brass lockseam tube. 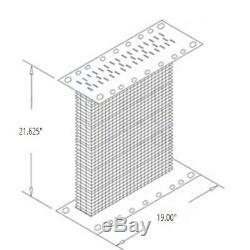 The radiator core has 5 fins per inch and 3 rows of tubes. It is 21.625" tall and 19" wide. Sale Depends on Stock at the Time. Only the 48 contiguous States in the U. 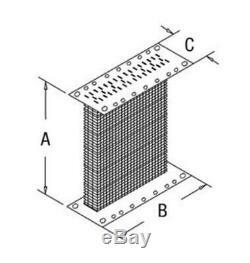 The item "AF1321R Radiator Core for John Deere Tractor G 70 720 730 JD Tractors Gas" is in sale since Tuesday, February 12, 2019. This item is in the category "Business & Industrial\Heavy Equipment, Parts & Attachments\Heavy Equipment Parts & Accessories\Tractor Parts". The seller is "stevenslake" and is located in Williamston, Michigan. This item can be shipped worldwide.